Imagine the scorching hot summers and suddenly your AC stops cooling! How uncomfortable is it to even imagine it? This is exactly what happens if your AC is not regularly serviced and maintained.The reason for this may or may not be the technical fault. Thus, we should be aware of some basic faults to be able to take the right step to get it right. Congested air filter: Since the basic function if a filter is to pass the air properly, the filter gets choked up due to dust and dirt present in the air. This restricts the air cooling to a great extent. Thus, the filters must be regularly cleaned. Undersized air conditioner: This is a very common issue people face nowadays. The cooling capacity of the Ac hugely depends on the size of the room. People usually choose the AC as per their budget and ignore other important factors such as the capacity of the AC. The capacity (tons) should be selected on properly measuring the size of the room. Dirty cooling coils: Air conditioners have two cooling coils; evaporator coil and condenser coil that are majorly responsible for air cooling. These coils, when not cleaned regularly, cause the building of frost and ice on the coil. When the condenser coil gets frozen, it restricts the air cooling. Leakage of refrigerant or insufficient refrigerant: Presence of low levels of coolant or refrigerant results in restriction of air cooling since coolants are responsible for the cooling of the warm air. Thus, if there’s insufficiency of the coolant, the AC may not cool the room as much as it is normally supposed to do. Defective/broken thermostat: Being a sensor, thermostat continuously senses the room temperature and is responsible for signaling the compressor to adjust the cooling cycle accordingly. Thus broken thermostat fails to signal the compressor on time and affects air cooling. To avoid the technical faults from restraining the cooling of your AC, you must not only maintain but also get your AC Serviced regularly. 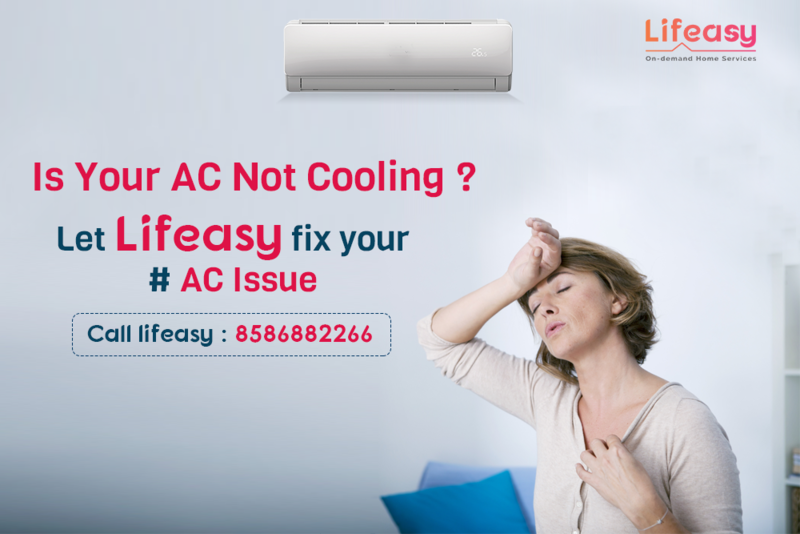 Get your ACs regularly serviced and save yourself from hassles during the hot summers. Finding the right technicians has now become easy with Lifeasy.